We also included new balancing changes with a revamp of stats for the Champion creatures. [Fixed] Quick load would get stuck in rare cases. [Fixed] Council Hub towns have light shaft particle when selected. [Fixed] RMG issue that caused some armies in the underground to be directly inaccessible, which caused bugged AI behavior. [Fixed] Heroes portraits shuffled on loading a save game. [Fixed] Wrong cursor icon on Abandoned Mine/Prison with random army. [Fixed] Weekly based resource AM buildings would lose ability in rare cases after loading a save game. [Fixed] Invalid logic with AI exploration, causing some adventure map sites to never be uncovered by the AI. [Fixed] Town development for Fortress towns for AI (now goes beyond level 2). [Fixed] Combat map lighting on transition from adventure into combat. [Fixed] Not destroying allied players caravan outpost on visit. [Fixed] Some maps in the Duels section not having a Thumbnail, or localization. [Fixed] Renewal to only give mana on the hero`s own combats. [Fixed] Creatures not inheriting the morale/luck bonus that was defined in their base stats. [Changed] Neutral stacks in starting zone of RMG to be always different from the starting faction of the owner of the zone. [Improved] Rewards for Dragon Utopia, Shantiri Ruins and Dangerous Cave. [Improved] Money income from Town Hall in the intermediate tiers. Now Town Hall and City Hall provide 500 more gold each. [Improved] Performance when Hero is moving on big adventure maps. [Improved] Increased Morale cap to 75 instead of 50 globally. [Improved] AI will be more focused on its objectives (when conquering sites and picking up stuff that`s guarded). [Improved] AI will be more inclined to use buff sites. 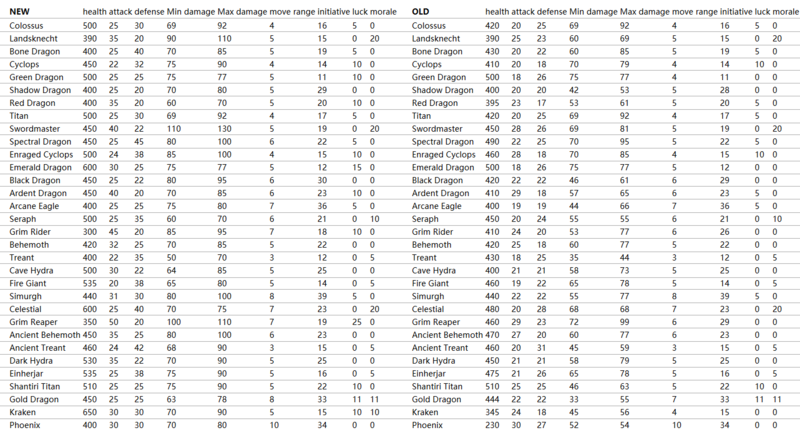 [Improved] General overhaul of all the champion creatures’ stats for Skirmish and Duels. [Improved] Reduced price of Resources in the Marketplace in general. [Improved] Reduced cost of Elite and Champion Dwellings so they are affordable. [Improved] Reduced diplomacy costs by half globally. [Fixed] Shantiri Titan Regeneration ability. [Fixed] Building Caravan Outpost during combat with hotkey. [Fixed] Treant Entangling Roots ability not disabling movement. [Fixed] Surrender to correctly preserve the troops you paid for. [Fixed] Ancient Behemoth Retaliation Prediction. [Fixed] Aura of Purity vs. Magic Touch. [Fixed] Nature`s Revenge for Blade Master`s Whirling Death ability (marks are getting applied to all targets, not just one). [Fixed] Deadly Strike (stopped critical hits from happening before). [Fixed] Summoned shooting obstacles (Fire Sentry, Freezing Orb,) targeting for Leaf Daggers and other active abilities. [Fixed] Preview of percentage-based spells, such as Implosion. [Fixed] A big rock obstacle with wrong collision. Now it will properly cover what it should. [Fixed] Surrender/Flee button being functional in Duel. [Fixed] XP preview when the defender wins a combat. [Improved] AI that is in an obvious loss situation will try to inflict more attrition damage by killing as much of the player`s creatures as it can instead of playing for a "win". [Improved] Adjusted AI behavior with Mobile Shooter to be more cautious instead of suicidal. [Improved] performance for AI calculations and active unit change. [Improved]AI will try to avoid hostile per-tile spells in combat more. [Improved] Made Good/Bad Morale triggering more visible. Changed the Nova ability of Disciple to be cast-able only once per combat. [Fixed] A problem in Map 2 that caused a Secondary quest to spawn an enemy that prevented the peaceful solution of it. [Fixed] A problem in map 2, where the quest to give 10% of your army only worked under certain circumstances. [Fixed] A problem in Myrim`s Scenario map where some artifacts were providing 2 items instead of 1. [Fixed] A problem in Myrim`s Scenario map where a dwelling in the initial area wasn`t part of the AOC of the town. [Fixed] An issue in Myrim`s Scenario map where narration text boxes could appear during the AI turn. [Fixed] An issue in Myrim`s Scenario map where the enemy players didn`t show the correct name. [Fixed] An issue in Dungeon map 4 where several combat dialogues weren`t triggering. [Fixed] An issue in Ivan map 2 (Vanilla) where a dialogue wasn`t triggering. [Fixed] An issue in Thunder in the Tundra, where one landscape component was causing issues when opening the map. [Fixed] The fact that the player could hire Bart Brimstone from the Hall of Heroes in the Tear of the Old One map. [Fixed] Several issues in Alternate History related to factions of Dwellings not being the same as the Player`s initial faction. Also fixed the fact that Player 1 had 3 Elite Dwellings instead of 1 Core and 2 Elites. [Fixed] an issue in Sylvan map 4 where one dialogue was attributed to Wysloth when it was Danan speaking. [Fixed] An issue in Map 6 of Fortress campaign where Uplay rewards weren`t working. [Fixed] Two neutral creature stacks in the teleporter path of fracture Time to have the correct XP values. [Fixed] A blocker in Lost tales 1 - Map 5 that prevented heroes from interacting with one of the main quest buildings. [Fixed] Two fire camps in Final Map 1 (Vanilla) that were providing 0 resources. [Fixed] A visual problem in Dungeon 2 where some towers from the wall weren`t properly illuminated. [Fixed] A problem in Fortress Map 3, where a defeated hero could still capture a lost town. [Fixed] An issue in the first fortress maps with the lights of the manipulators of the catapults. Changed Hathor`s specialization to be Pugnacious instead of Engineer. [Fixed] Last human player remaining in a multiplayer game with AI player automatically won every combat. [Fixed] Player getting stuck in the game after the game was finished. [Fixed] Players were able to do actions in town screen during the AI turn under certain circumstances. [Fixed] Local Guards not giving EXP and not triggering Necromancy. [Fixed] Learned spells by Arcane Intuition disappearing after combat. [Fixed] The possibility of the game getting stuck when timer runs out and player doing a quick combat at the end of the turn. [Fixed] Not being able to attack AI heroes because they are wrongly considered of being In Combat already. [Fixed] Being able to view AI hero inventory if having all heroes dismissed after AI turn. [Fixed] Skirmish objectives still being triggered for spectating players. [Fixed] Popup, "wait for answer" not disappearing when attacking another player during retreating. [Fixed] Several issues in first turn after loading a save game for Sim-turns. [Fixed] Game getting stuck when winning vs AI hero during AI turn. [Fixed] Loading a save game with less players then when saving now turns the missing players towns into neutral and removes his leftover armies. [Improved] Multiple minor fixes that makes the Multiplayer more stable and robust to not go out of synch. [Fixed] Black Market giving gold to all players in multiplayer when selling items. [Fixed] Tracing in town screens to return the building under cursor more accurately. [Fixed] Forts and other neutral sites sometimes spawning 2 garrison armies. [Fixed] Dragon Fang Necklace now correctly counting as a set artifact. [Improved] Adventure map performance when moving around with a hero on larger maps. [Fixed] A case where Creatures would disappear/re-appear from the Deployment Bar. [Fixed] Inaccurate saving of deployment. [Fixed] An issue that was cause a click on a different position than the mouse, when game was unfocused. [Fixed] Combat-log not restoring correctly after save/load screen was opened. [Fixed] Incorrect message while spamming Quick-Save. [Fixed] Completing an Addon-Campaign no longer displays a progress towards the Main-Campaign. [Fixed] Option, "Show HP bars" is correctly saved when changing it in the main menu. [Fixed] Spells learned from helmet items would be learned permanently after loading a save game. [Fixed] Heroes would lose spells/abilities/skills after performing save/load operation in very rare cases. [Fixed] Neutral flag would appear above captured Forts after loading a save game. [Fixed] Missing surface and underground zones when using Mixed Terrain. [Fixed] The lighting of underground zones being too dark. [Improved] Changed Neutral stacks in starting zone of RMG to be always different from the starting faction of the owner of the zone. [Improved] Changed value of Rough Terrain Movement Cost from 1.66 to 1.0 for all RMG zones. Applied only for In-Game RMG. [Improved] Added 5 Addon buildings to the RMG: Runic Forge, Rune stone, Pirate Cove, Abandoned Mine and Dwarven treasury. [Fixed] That Editor becomes unresponsive when deleting the underground surface of any randomly generated huge scenario map. Added 8 Steam achievements for the campaign maps of the addon.